A good barometer of fan frenzy for an event is the ticket resale market. One might assume that a matchup between a pair of 2-0 teams, in one of those teams' home opener, featuring an MVP candidate and a quarterback who has dominated headlines for the last month, would make for a robust market. And, well, so far that assumption wouldn't quite be correct. While the Vikings/49ers game is technically a sellout, as of Tuesday afternoon, more than 1,700 tickets for the Vikings/49ers game remained on Stubhub.com, including some for $15 -- half the price of the lowest face value single-game ticket offered by the Vikings. Another 1,500-plus tickets remain on NFL Ticket Exchange, which is run via Ticketmaster and has the NFL's stamp of approval. Tickets can ba had there for $23 -- still less than the $30 lowest single-game price offered by the Vikings. It was unusual enough for a game of this seeming magnitude for StubHub Corporate Communications Manager Joellen Ferrer to contact us. While it's clear what her mission was -- get the word out, try to sell some tickets -- things she had to say along the way were quite interesting. 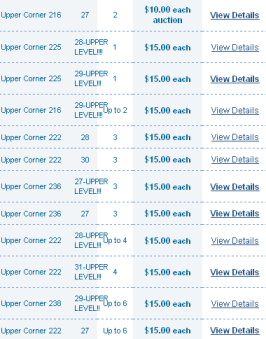 While the number of tickets left isn't necessarily unusual for a game four days away, the prices are. "It’s quite shocking to me," Ferrer said. "That’s the reason I’ve really honed in on this story." When asked to speculate about a reason, she offered this: "Maybe the secondary market has bottomed out for this game? Maybe it’s not quite the demand it’s expected to be?" Whatever the case, supply seems to be outpacing demand, which (of course) brings prices down. That's basic business. The question of why is a little more complicated. If we had to guess, we'd say people are 1) loading up for the Packers MNF game the following week, 2) still enjoying the last gasps of nice weather and trying to unload the first game of a season ticket package, 3) unmoved by a pair of pedestrian road victories, 4) feeling the effects of the economy, 5) Not as enamored with the in-game attendance experience as they once were or 6) some combination of all of the above.